There is much uncertainty about the impact that new organizations will have on the space business, said Steve Isakowitz, CEO of the Aerospace Corp.
COLORADO SPRINGS — It’s been a dizzying news cycle since President Trump ordered the Pentagon in June to establish a Space Force and signed a directive in December to stand up U.S. Space Command. The Pentagon in February dropped a legislative proposal, followed by a budget request in March and a push to sell the plan to skeptical lawmakers. In the midst of all that, the president nominated Gen. John Raymond to lead U.S. Space Command, and the acting secretary of defense signed into existence the Space Development Agency. Meanwhile, the Air Force Space and Missile Systems Center in Los Angeles that oversees most military space acquisitions is undergoing its largest reorganization in decades — known as SMC 2.0 — the details of which are still being ironed out. 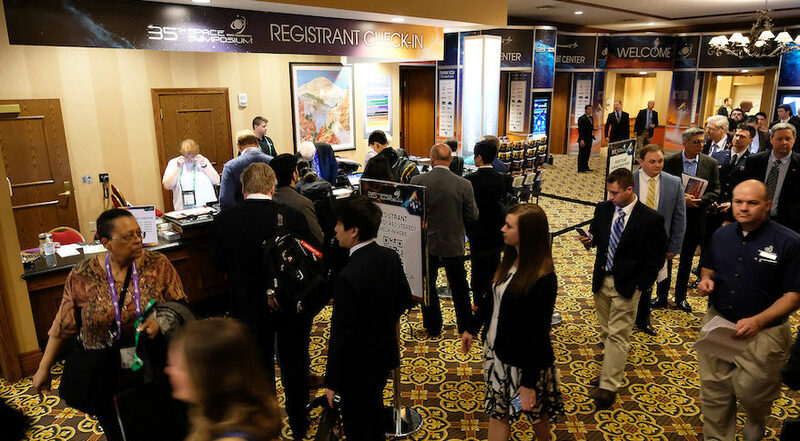 Government officials, space and defense industry executives are gathering this week at the 35th Space Symposium and the burning question that many are asking is what all this means for the space business. Further, they wonder who ultimately will be in charge of key decisions such as what technologies the military will buy and what programs will get funded. Industry contractors dislike ambiguity about who calls the shots in military programs, but they recognize that many questions will remain unanswered until Congress weighs in on the Space Force proposal and more details are known about the roles of the Space Development Agency and U.S. Space Command. “There’s a lot of uncertainty, and people are trying to figure out what this means,” said Steve Isakowitz, CEO of the Aerospace Corp., a nonprofit federally funded firm based in Los Angeles that advises the Defense Department and works closely with the Air Force Space and Missile Systems Center. Isakowitz has spent a lot of time in Washington, D.C. lately, meeting with government officials and hosting space industry briefings. “People have been waiting for a series of shoes to drop,” he told SpaceNews. There is much anticipation about the upcoming Senate Armed Services Committee hearing on the Space Force that could shed light on where Congress might be headed. As companies wait for the reorganization dust to settle, they are hearing urgent calls from DoD and the Air Force to step up their game in the face of growing competition in space from China and Russia. “Adversaries are developing capabilities at a pace where they have not yet surpassed us, but are quickly gaining,” said Isakowitz. Aerospace Corp. has been in discussions with SMC officials and contractors on what needs to change in the space business to respond to these needs. Isakowitz said the Air Force is shifting its traditional approach to developing and acquiring satellites from slow-paced developments of large and expensive spacecraft to faster assembly using components that are already in production. He calls that effort “continuous production agility.” Companies want to hear more about what they can do to meet these needs, he said, but most of the discussions so far have been about bureaucracy and reorganization. The Pentagon’s decision to form a Space Development Agency set off both confusion and anticipation about what it will do exactly. Isakowitz said he has met frequently with Fred Kennedy, the newly appointed director of the SDA, who most recently was the head of tactical technology programs at the Defense Advanced Research Projects Agency and is known for embracing unconventional approaches in technology developments. Kennedy and his boss Undersecretary of Defense for Research and Engineering Mike Griffin have recommended that the SDA start building a large constellation of small satellites in low Earth orbit, what they call a “proliferated LEO transport layer” as the foundation to develop military capabilities in space such as communications and surveillance. The SDA would not be encumbered by traditional Pentagon red tape, Griffin has said, and would buy technology already available from the commercial space industry. While the SDA is commanding the spotlight now, there could be more change on the horizon if Congress authorizes a new military branch to oversee space.